Thai Coconut Milk is made by pressing fresh, ripe coconut meat. It is used for curries, satay sauces, baked or frozen desserts, and drinks. Coconut milk is creamy, and full of coconut flavor. It is very different from coconut water, which is the liquid in a young coconut. Although coconut milk is high in saturated fat, many people say that the coconut fat is not bad for you. You can find coconut milk in cartons near almond milk and soymilk, but this coconut milk is diluted for drinking. The coconut milk used in recipes is the coconut milk you find in cans. 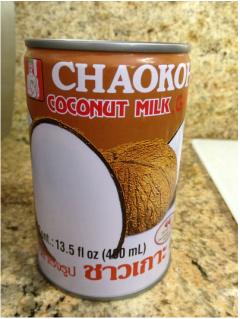 CHAOKOH coconut milk is well known in Thailand and many Thai people like it the most. It is also very easy to find. Coconut Water, Milk or Cream? Coconut water is the clear, natural juice you’ll find if you crack open a coconut, coconut milk and cream are made by boiling the coconut meat with water. The difference between milk and cream is in the concentration and consistency. Coconut milk: Coconut milk is a liquid like cow’s milk, made from simmering one part shredded coconut in one part water. Coconut milk is the basis of most Thai curries. Coconut cream: Coconut cream is much thicker and richer. It is made from simmering four parts shredded coconut in one part water. The cream that rises to the top of a can of coconut milk is also considered coconut cream. Cream of coconut: Cream of coconut is a sweetened version of coconut cream, and is often used for desserts and mixed drinks. Because of the added sugar, it is usually not interchangeable with coconut cream.